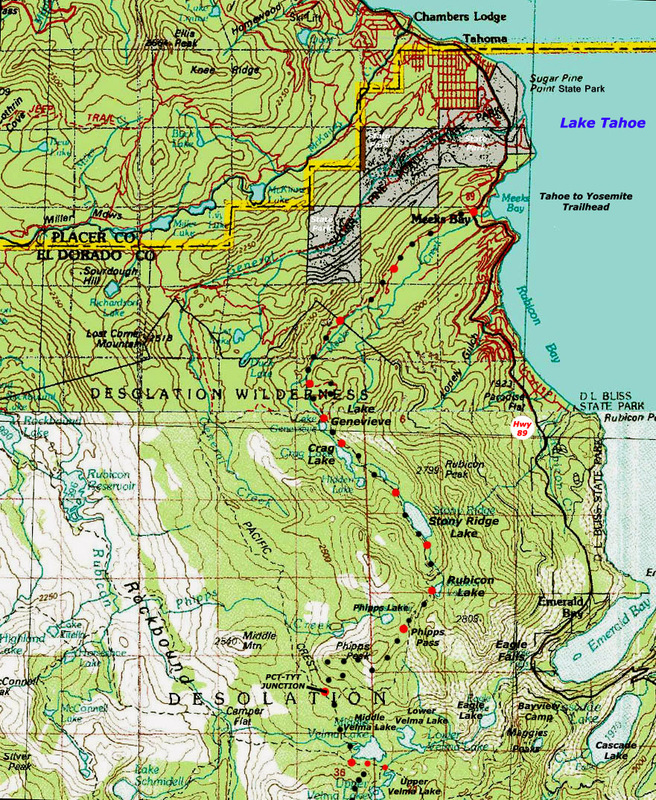 The main feature of the 30 minute USGS Topo Map series on this site is to put these long distance trails into a broad context of local rivers, roads, mountains, trails, and trailheads to expose potential alternative backpacking routes, side trips, loops, and short in and out hiking trips that we can explore across Desolation Wilderness. These maps give our long hikes local context. In the North Desolation Wilderness we can see a possible hiking Loop out of and back to Meeks Bay via the General Creek Cross-Country route from the North side of Genevieve Lake. This is a faint non-maintained trail to the Pacific Crest Trail North of where our TYT joins the PCT and TRT. Hikers can loop back to Meeks Bay via Phipps Pass. The map above shows the General Creek Trail as a maintained route. It is not, but it is well traveled. We have medium-length destinations both to our North and South. Hiking South from the TYT junction with the PCT we can hike East from Upper Velma Lake to exit the Desolation Wilderness through the Camper Flat or Eagle Falls trailheads at Emerald Bay. As we hike South through Desolation Wilderness we are going to encounter a series of trail junctions leading to trailheads along the Western shore of Lake Tahoe and its bays and associated lakes. North of Meeks Bay a series of trailheads along Highway 89 offer access to the PCT route as it makes its way North from Desolation Wilderness up to Highway 80 passing East and West on the Northern Edge of the Tahoe Basin. 4.39 miles South of Meeks Bay Lake Genevieve is the first in a series of pretty lakes in a gently rising valley leading to the climb to Phipps Pass out of the South end of the valley. The South side of Stony Ridge Lake marks the end of this series of Lakes and the valley too, and the beginning of our short but steep climb up to Phipps Pass. Yet the lakes are not done. Tiny Rubicon Lake, half surrounded by rock and half by forest precedes Phipps Pass. Beautiful Rock formations emerging out of forest as we climb higher frame the fine views decorating our last steps South to Phipps Pass. Lake Tahoe, Emerald Bay, and Cascade Lake all combine to provide a stunning backdrop to our views around the Southwestern corner of the Tahoe Basin highlighting our views of the amazing granite formations around Phipps Pass. Nature, in it's infinite Wisdom, gives us The Finger as we pass. Ha, I love Nature, though its fickle finger sometimes tries to rub us out, when brutally and beautifully informing us about ourselves. From Phipps Pass we begin to get great views Southeast of our next destination, Middle Velma Lake, backdropped by Maggies Peak. Dropping off the South flank of Phipps Pass quickly brings us to our junction with the Pacific Crest and Tahoe Rim Trails laying .85 of a mile North of Middle Velma Lake. Forest Road 14N42 begins the Tahoe to Yosemite Trail. Meeks Bay on the West shore of Lake Tahoe along Highway 89. 11.5 miles South of our Meeks Bay Trailhead the Lake Tahoe to Yosemite joins with the Tahoe Rim and the Pacific Crest trail just North of Middle Velma Lake. These unified routes continue South together through Desolation Wilderness. Tahoe-Yosemite, the Tahoe Rim, and the PCT routes. The route of the Tahoe to Yosemite Trail from Phipps Pass South down to the Pacific Crest Trail junction has been rerouted. In addition, a "new" trail junction routing the Pacific Crest Trail up to the North side of Fontanillis Lake rather than along Upper Velma Lake differs from the old USGS 30 minute topo hiking map. I have noted both of these route modifications on the map above. Between Highway 89 at Meeks Bay and Highway 50 crossing Echo Summit.